The following Key Notes, Lectures & Workshops can be adjusted to any specific business, expo or event. Just let me know the business industry, type of group or event and I will tailor my speech to meet your objectives. For many years people have asked me "do you have any non-business talks you could give our group?" When I ask them what type of talk they are look for, many would say "something to help people become successful in their everyday life." Having lived a very full and successful life that included some downturns that required a re-evaluation of my life and the direction I was going, I always say "yes, I have many great stories of life's successes and failures." 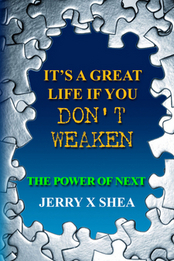 Now for 2013 I have come out with my new inspirational book IT'S A GREAT LIFE IF YOU DON'T WEAKEN, The Power Of NEXT. If you are looking for a Key-note or lucheon speaker that can address your whole audience, including the spouses and friends of those attending your event, then we need to talk. My inspirational talks, from my new book, are guaranteed to entertain and delight your whole audience. Everyone attending will walk away with at least one thing that can help them have a successful and rewarding life style. Tell me about your group/event and I will provide some choices for a great presentation. one word "next" and how it can change their life. of what not to do. "I sure wish I knew then what I know now." 5. Ten Key Elements of a Successful Business. business that men will not tell you. This is a 30 - 45 minute speech on Prospecting For New Clients. Today more than ever, small business owners are hungry for any information they can get that will help them grow their respective businesses. That is what I have to offer your membership. has a great twist with the message "what is your twisted ankle in life?" 2. DOWNSIZING: We are a nation of "junk collectors" and we leave that junk for our children. Discover simple ways of saving memories while cherishing family heirlooms. This is a speech for the over 50 group. 3. TEACH YOUR CHILDREN WELL: We may be living in a society of electronic social media, but we can't forget to teach our children the finer points of face to face contact with people. As an employer that hired teenagers I was amazed at how unprepared many of our young folks are for the workplace. This talk is full of tips parents and grandparents can use to teach and prepare their teenagers for the real world. 4. Die between 55-65 or live to 80 or 90 - Which one do you want? This talk follows Mr. Shea's 12 years as a cardiac technician and what it takes to live a long and healthy life style. 5. How one word, NEXT, can change your life for ever: Mr. Shea's philosophy of a life that keeps moving forward without getting stuck on hold. service industries that do not have a retail store. e. How to Write a Business Plan. needs of growing the business. NOTE: The workshops above are my most requested and popular workshops. If you have a specific small business workshop you are looking for, please give me a call as I most likely have it. Copyright © 2011, 2012, 2013, 2014, 2015, 2016, 2017 by Jerry X Shea -- WARNING - DISCLAIMER - The purpose of this website is to educate and entertain. Jerry X Shea shall have neither liability nor responsibility to any person or entity with respect to any loss or damage caused, or alleged to be caused, directly or indirectly, by the information contained on this website. It is with the understanding that Jerry X Shea in not engaged in rendering legal, accounting or financial advice. Laws and practices often vary from state to state and if legal advice or other expert assistance is required, the services of a competent professional person should be sought. The information on this website is factually accurate, except that, in some cases, the names, locales, and individual traits have been fictionalized to preserve coherence while protecting privacy.